I work in marketing. I appreciate that Facebook is constantly trying to find ways to serve up content to its users. Autoplay videos are pretty much all I see these days (in addition to random people going "live"), and once in awhile, one of them will catch my eye and I won't just scroll past it. I scrolled upon a decent seeming, but not vegan recipe by Tasty, one of Buzzfeed's content hubs for short, to the point recipe videos. Often described as "too fast moving," in the comments, these videos are meant to be watched real quick just to give someone a general idea of how to make a recipe. I think this applies to all of the visual learners out there. 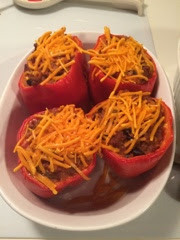 In the past couple days, I think I've seen a Tasty video on how to make "stuffed taco peppers" about 8 million times, and even though the recipe wasn't vegan, I knew I could easily make it so. I made these for dinner the other night and I have to say, they were pretty incredible. While peppers are baking, pour Boca crumbles into skillet set to medium/high heat. This is a relatively quick, easy, tasty, and protein packed dinner that I know I'll be making again.